The University of Connecticut Actuarial Program in the Department of Mathematics began in 1976 with the creation of two new courses – Theory of Interest and Life Contingencies. The department also began offering the professional actuarial exams at that time. From the very first, the program grew rapidly. In the spring of 1979, the first majors in Mathematics/Actuarial Science were graduated. In 1984 we added a Concentration in Actuarial Science at the Master’s level. As of 2006, we have awarded 6 Doctoral degrees in Mathematics with a thesis topic in Actuarial Science. We have also added a Professional Master’s in Applied Financial Mathematics that serves a dozen students a year. A Center for Actuarial Studies promotes student participation in research projects on real-world problems. Today, the program has over 450 undergraduates, 39 master’s students and 7 Ph.D. students. We estimate that, since its inception, our program has contributed over 500 baccalaureate and 350 master’s graduates to the work force. Our Ph.D. alumni and their thesis titles can be found here. The primary goal of our program is to provide students with a sound foundation in actuarial science and to prepare them for the examinations administered by the Society of Actuaries and the Casualty Actuarial Society, with the objective that each student passes at least two exams before graduating. There is a strong demand for our graduates in the large financial services industry in Connecticut and the surrounding Northeast. The quality of our students is recognized by grants from our corporate sponsors. The funds from these grants are used to award undergraduate scholarships and enhance our program. The UConn Actuarial Science Program has developed a close working relationship with insurance companies and consulting firms in the Northeast. Our actuarial fraternity, Gamma Iota Sigma, sponsors an actuarial Career Fair each fall. We also arrange on-campus interviews with our corporate sponsors. Students with good grades and have passed at least one actuarial exam usually are able find full-time employment or summer internships. Be An Actuary: Lots of information about actuarial careers, including information about what an actuary is, the actuarial examination process, and finding a job as an actuary. It also contains online issues of “The Future Actuary”. 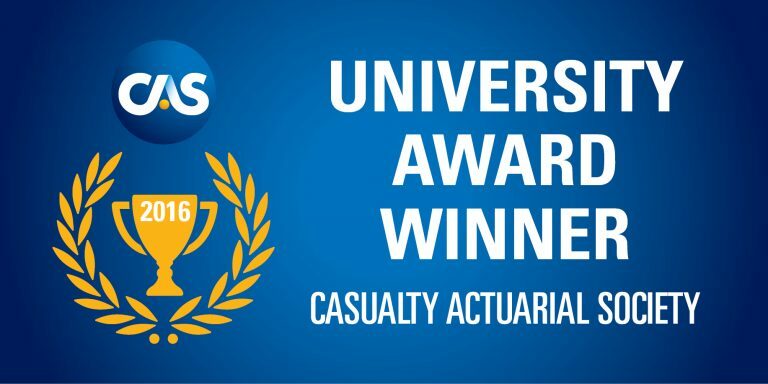 The site is maintained by the Society of Actuaries (SOA) and Casualty Actuarial Society (CAS). Gamma Iota Sigma Society: Actuarial Science Fraternity.